Fan Expo is upon us once again and I have some great new buttons! They are 1 inch gems that I am seriously ecstatic about. 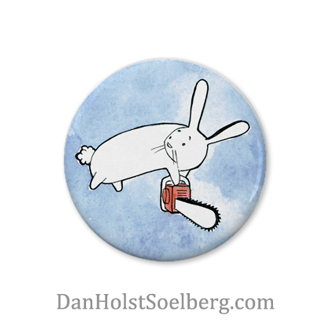 I’m also stocked with my new print, Bunnies + Chainsaws. 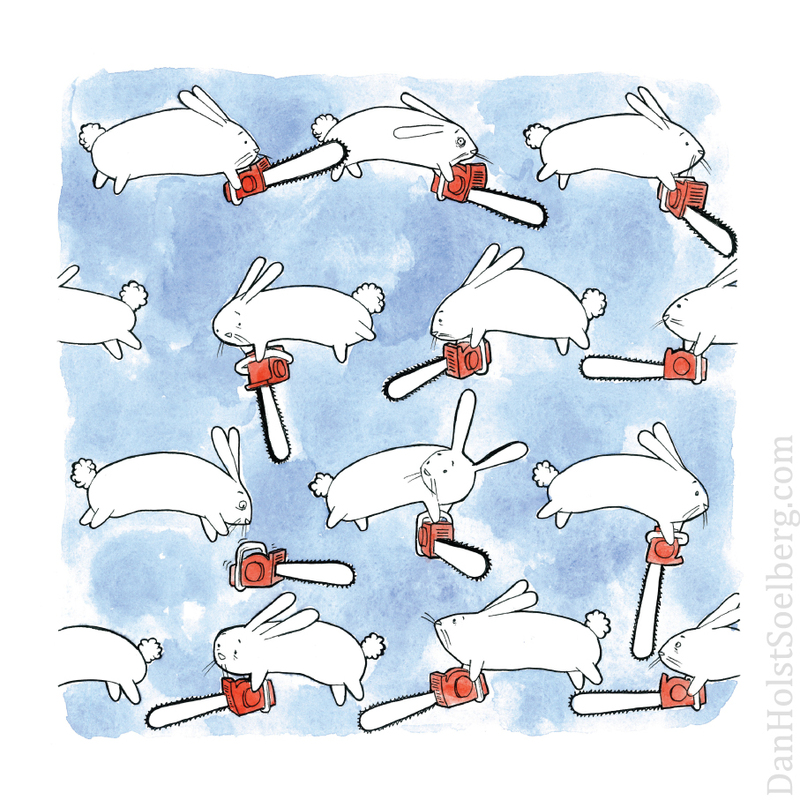 Bunnies + Chainsaws is a signed print that measures 32cm x 32cm. It’s the same size as a vinyl record jacket and fits a standard Ikea frame that comes with a mat. I feel like I’m constantly working on a new book that’s never finished. Mostly because I’m constantly working on a new book that’s never finished! It’s all about priorities, and deadlines. Lots of people are asking when I’ll have a new book and I promise I’m working on it. Thanks so much for the interest! It’s encouraging to hear the enthusiasm from everyone. Please feel free to share your photos and comments about my work here. I read everything. I’ll be sharing progress photos on Instagram and report on developments here. I want to take a moment to reflect on my personal creative projects and creative process. Here’s my confession: I have been going through a funk. I usually spend part of my mornings and evenings making things without deadline and free of anyone else’s direction. It’s my opportunity to be completely limitless in creative expression. For a long time now, I feel like I don’t have the focus or drive to make it happen. The mojo’s gone. The free-flowing creativity that was easy ten years ago has gone away. So, I’ve been beating myself up, which just creates a downward spiral. But something changed recently. I’m feeling energized and excited. What’s changed? Why am I suddenly driven and focused? I changed my perspective. Or rather, my perspective was changed for me. I took a week vacation with my family to a YMCA camp that completely shook up my brain. In an instant, all my daily routines and concerns were gone. There were no expectations at all. For a whole week! The stark contrast to my usual life showed me that ten years ago, my life was very different and I had fewer concerns. Over time, adult responsibilities mounted. Two kids happened. A different life creeped in so slowly that I didn’t notice. Tiny, incremental changes in direction are barely detectable from one day to the next, but looking back after ten years, and the landscape is completely changed. My mojo’s still there, but the time and space isn’t. Demands on me have mounted and taken up space in my life and in my head – space that used to be free for me to play. I miss playing. I can’t go back to the life I had ten years ago, and that’s not my goal. There’s a lot that I don’t want to change, but I can change my priorities and make sure that I live my values. I value playing. Play is necessary. I hope you find time to play today too. All the new buttons and the print shown above are available in my online shop. Fan Expo is in Toronto Thursday, August 30 until Sunday, September 2. Full details are on the Fan Expo website.